Here, in order to further investigate the existence of the blurry promoter in Tc1-like elements from other organisms and to assess whether mariner-like elements also have similar feature, we extended our study to the promoters of two additional members of the Tc1/mariner superfamily [Sleeping Beauty (SB) from fish and Hsmar1 from human] and two additional LTR retrotransposons (Tirant and ZAM) from D. melanogaster. Furthermore, we included in this study the promoter of hobo, a member of the hAT superfamily (named after the hobo, Activator and Tam3 founding elements ). The hAT superfamily represents an ideal outgroup to assess whether Class II elements, not related to the Tc1/mariner superfamily and able to undertake HTT [19–22], have blurry promoters that allow them to survive once transferred into distant genomes. 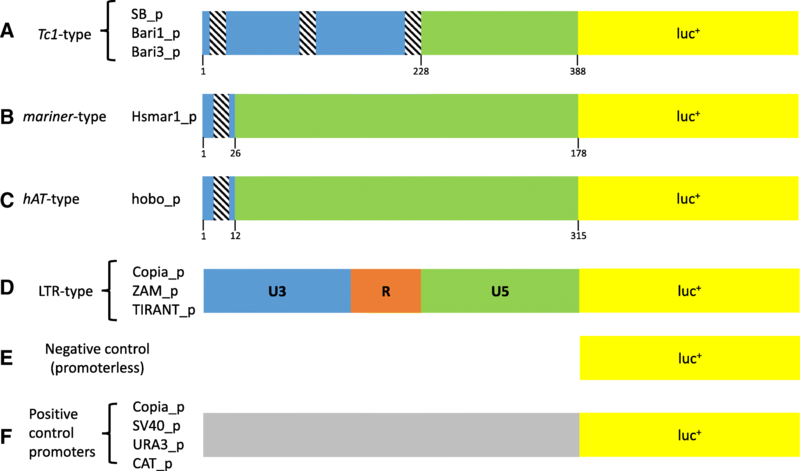 Despite being inactive as transposons, several thousands of SB and Hsmar1 relics, most of which contain the promoter sequences, can be found in the respective host genomes, suggesting possible impact on gene regulation in their native hosts. For example, transposon insertions can affect host gene expression by juxtaposition of their transcriptional regulatory sequences to endogenous transcription units, thereby overriding their physiological transcriptional program. D. melanogaster provides significant examples of transcriptional perturbation of host genes [51–55] due to potent TE-related cis-acting regulatory sequences, such as enhancers, silencers or insulators, mainly associated with LTR-retrotransposons [56–61]. Our results suggest that promoters of the analyzed TEs act as weak transcriptional activators, especially when they move to distant hosts. For instance, the promoters of Hsmar1 and hobo have a very low, although statistically significant, activity in E. coli. This could still have a biological significance, especially in the absence of additional repressive mechanisms that acted on the TE in the species of origin, leading to a successful invasion of the new genome.